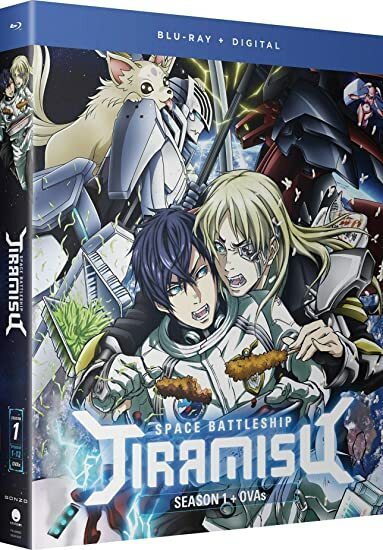 Space Battleship Tiramisu: Season 1 - BUY THIS BLU-RAY! The Earth Union is locked in a massive galactic war and the Space Battleship Tiramisu protects our planet from annihilation. Ace pilot Subaru Ichinose—socially awkward and plagued by an intense, almost sexual love for food—carries the fate of humanity on his shoulders. Pushing the limits of absurdity from the comfort of his warm, enveloping cockpit, Subaru will find out what it truly means to be alive in a truly unforgiving universe. THEN SEND IN A COMMENT ABOUT YOUR FAVORITE FUNIMATION TITLE (you may click on artwork above for a refresher) PLUS YOUR NAME AND ADDRESS TO contests@efilmcritic.com or WeLoveHBS@aol.com. (Just one e-mail please.) Put [b]"I LOVE TIRAMISU ON A SPACESHIP" in the subject line and cross your fingers. We will draw names and one of the prizes could be yours. Only 1 entry per household.